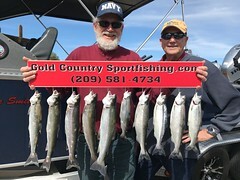 Returning client Butch, Ton and Don were on board on May the 24th, the morning started out windy again, however not as bad as the previous week, but we still ran for cover for a couple of hours as it was just to difficult to fish the way I wanted to. After the wtwo crappie and a bass. I was confident that we would catch some trout. After some time I switched things over to my custom lures and we did have a couple hook ups, but nothing stuck, so I switched back over to frozen shad, you don’t cover water at a much slower pace doing this but it can be more effective, after about 45 minute of this I was setting a rod when I noticed the back rod getting hit , so I hollered out were getting a bite and as I grabbed the rod the fish hit again, so I pulled it out of the release and began reeling and when I felt the weight of the fish I handed it off to Butch and the fight was on, I could tell immediately that we had a big fish on and as Butch was fighting the fish, the fish was taking line at a rapid pace and also the line was going straight down and not giving and inch, finally he was able to start putting some line back on the reel but then again more line would peel off the reel very rapidly, after a great struggle we could finally see a little color and this was not what I was expecting and as it came closer I was well aware of what we had, I wasn’t sure if the fish would fit into my net, but it did and we all could not believe our eyes…… A German Brown, I lifted the fish into the boat and told Butch let’s get a couple of photos and release it back into the water and he said definitely, after I weighed it (Nine pound ten ounce German Brown) I worked on trying to revive a true trophy back into the lake, I tried for 45 minutes , but to no avail, as It swam off once about twenty feet away from the boat it went belly up, I tried and tried and tried but it had been hooked to bad, So he is going to have the fish mounted. 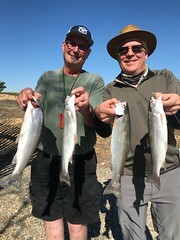 We did go on fishing and we had two other monster rainbows on that was lost just beyond the boat. A great day with great people. 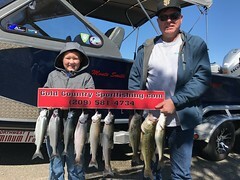 This entry was posted in California, Gold Country, Melones, New Melones, New Melones fishing guides, Rainbows, Trout. Bookmark the permalink.